ARCHIBALD, SAMUEL GEORGE WILLIAM, office holder, judge, lawyer, and politician; b. 5 Feb. 1777 in Truro, N.S., third son of Samuel Archibald of Truro and Rachel Todd of Massachusetts; m. first 16 March 1802 Elizabeth Dickson of Onslow, N.S., sister of Thomas Dickson*; m. secondly 15 Aug. 1832 Joanna Brinley, née Allen, widow of William Birch Brinley; d. 28 Jan. 1846 in Halifax. In 1792 Archibald went to Massachusetts, where his mother’s relatives supervised his education at Haverhill and Andover until 1796. 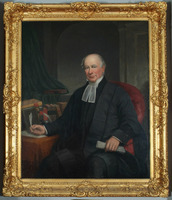 On his return he thought first of becoming a Presbyterian minister; then he served as protonotary of the Supreme Court and clerk of the peace for the district of Colchester before beginning the study of law in the office of Samuel Bradstreet Robie* about 1800. Two years later he married 15-year-old Elizabeth Dickson, a member of a family that was highly influential in public life. Within a few months he became judge of probate for the districts of Colchester and Pictou. On 16 April 1805 he was admitted as attorney and barrister and the following year elected to the House of Assembly for Halifax County, which then included the districts of Pictou and Colchester. Since his grandfather and father had been assemblymen and his eldest son, Charles Dickson*, was to be one later, four generations of the family in lineal descent served as members. Once Archibald and three of his Dickson brothers-in-law were members at the same time, and someone unkindly suggested that an Archibald-Dickson alliance engaged in log-rolling to secure road votes favourable to their constituents. From the outset Archibald had assets that would ensure his success both as a lawyer and as an assemblyman. Peter Lynch, a Halifax lawyer and historian, remembered him as “a more than ordinarily handsome man, of great suavity of manner, with a melodious voice, fascinating address, and a thorough knowledge of human nature,” who spoke “with great ease, elegance, and fluency, his periods rhythmic, and the flow of his language . . . sparkling.” Archibald’s first days in the assembly were marked by an almost unprecedented act, Lieutenant Governor Sir John Wentworth*’s rejection of William Cottnam Tonge as speaker. The record does not indicate if Archibald joined in the protests, but when the new speaker, Lewis Morris Wilkins, announced that he would be absent to attend a meeting of the governors of King’s College, Archibald got the house to adopt two resolutions declaring that the first duty of the speaker was to the assembly and that the summons to Wilkins was disrespectful to it. Ever the constitutionalist, he early showed his determination to resist any infringement of the lower house’s rights. More generally, Archibald’s early years as an assemblyman were marked by his close attention to the improvement of roads, especially those running eastward from Halifax. A little later he gave strong support to Thomas McCulloch and Pictou Academy. 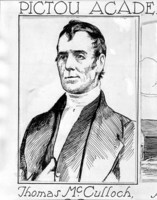 A secessionist Presbyterian with a deep religious faith, “he never uttered any of the cant of the day on the subject” and took no “active part in public religious exercises.” But he did oppose the exclusiveness of King’s College and for two decades supported McCulloch’s efforts to have Pictou Academy elevated in status and given a permanent annual grant. Although he recognized McCulloch’s failings – he once wrote to judge Peleg Wiswall that “the Emperor has become the real John Knox of Nova Scotia and threatens to eat you church men one and all” – he also stated more than once that he wished he had a tithe of the principal’s talents. His stand on Pictou Academy not only brought him into conflict with the extremists on the Council such as Richard John Uniacke* Sr, but also prevented him from developing a genuine rapport with John Young and his family, who as Kirkmen opposed the secessionist McCulloch. Indeed, “in the management of causes and . . . in the management of a jury, he . . . came to be without a rival,” the more so because he could “touch every emotion.” Judge George Geddie Patterson called him “the greatest verdict-getter we have ever known.” Both his contemporaries and more recent students have held that he was neither learned in the law nor willing to undertake the drudgery of ferreting out “the dry detail of the law connected with a cause.” In particular, A. 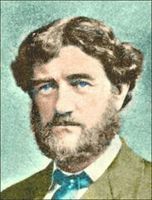 A. MacKenzie has suggested that he was “not in fact the great jurist of the family legend but a quick-witted story-telling jury lawyer, who talked himself out of scrapes when a lad, and later into the jobs he coveted.” Peter Lynch, who saw him in action, noted that he made full use of the lawyers associated with him in a case, especially James F. Gray. “A hasty examination of [Gray’s] briefs sufficed to give his senior as much knowledge of a case as could be obtained by others with hours of thought and labor.” But Archibald’s later career demonstrates that these estimates tell only part of the story. From 1817 to 1830 the wheel of fortune turned steadily in Archibald’s favour. Seldom did he spurn the mighty of the land if he could avoid it. 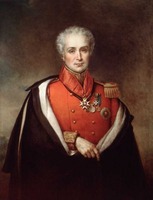 In 1818 he acted as surrogate general of the Vice-Admiralty Court, helping to clear up the rest of the old prize cases, not so much because he wanted to, but because it was “pressed upon me under circumstances that would have rendered it impolitic to have refused.” That same year he made the motion for setting up the provincial agricultural society, and in 1822 he established an oat mill in Truro at his own expense. Much later, in a barb aimed at John Young, he pointed out that he was “no theoretical speculator” in agricultural possibilities, but had spent his own money to demonstrate their practicality. 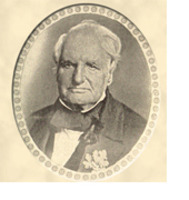 From a trip to Britain and Europe in 1824 he returned, according to Thomas Chandler Haliburton*, with many anecdotes of the Old World, having seen Paris, “touched at Brussels, spoke in Strasburg, and provisioned at Whitehall.” He also received an honorary lld from the University of Glasgow and accepted the chief justiceship of Prince Edward Island after being assured that he would not have to live there. In November 1824 he spent three weeks on the Island clearing up the chaos in the Supreme Court, the objective behind his appointment. Because of Robie’s elevation to the Council in 1824, the speakership was vacant when the assembly met the following year. Archibald was elected to the office without opposition and held it until 1841. 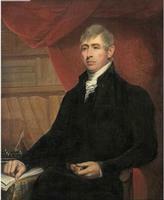 After his death Howe paid him the compliment of saying: “A more dignified and imposing Speaker, we never saw in the Chair of any Legislative Assembly.” In 1824 he had been accused, along with the other lawyer-assemblymen, of unnecessarily foisting four major judicial appointments upon the province. Two years later he was to benefit from this expansion of the courts when, with the appointment of Robie to one of the new offices – the master of the rolls – he succeeded him as solicitor general. But his non-residence in Prince Edward Island was causing serious dissatisfaction with the performance of his judicial duties there. Never giving any serious thought to abandoning his large professional practice and major offices in Nova Scotia or to his hopes of becoming chief justice of that colony, he resigned his Island office in 1828. In 1830 Archibald was at the peak of his fortunes, “the ornament of the Bar – the master spirit of the [assembly] – and the felicitous humourist of the social circle.” At splendid dinner parties in his spacious residence in Halifax, his polished wit and his skill as a story-teller – perhaps the best in the province – came fully into play. His country estate at Truro, where he resided several weeks a year, was according to his biographer, Israel Longworth, a provincial showplace, “studded with gigantic elms . . . [through which] the beautiful [Salmon] river meandered in graceful curves.” There the Dalhousies, the Kempts, and “the simpler inhabitants of the Country, shared his hospitality and sang his praises.” Archibald’s one remaining object – to be chief justice – was to be foiled by the “Brandy Dispute” of 1830 [see Enos Collins*]. In a series of speeches, necessarily given in committee, he argued that the power of the assembly to grant a revenue was one of substance and not form. “Consequences most serious . . . will follow, if we are to be used merely as a machine in the hands of His Majesty’s Council, to prepare the revenue bills in the manner they shall dictate to us. . . . we possess a right, which to an Englishman and a freeman, is the dearest of all rights – that of taxing ourselves, without the intervention or dictation of any power upon earth.” Above all, he emphasized that as speaker and “the natural guardian of the rights and privileges of this House,” he had a clear duty to intervene. Under this urging, the assembly stuck to its guns even though it meant the loss of the appropriation and revenue bills and all the concomitant evils. 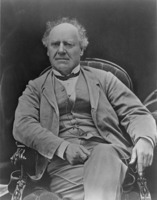 A delighted Howe stated that Archibald’s speeches had placed him “on an elevation which in the whole course of his political life he never before attained,” while Jotham Blanchard was almost as laudatory. In the election that followed the voters overwhelmingly condemned the Council and Archibald led the poll in Halifax County. But his stance was that of a constitutionalist, not that of a populist or reformer, and it aroused expectations that he could not fulfil. The Council’s supporters contended that even before the “Brandy Dispute” Archibald had forfeited public confidence “in consequence of his uncandid intriguing for promotion” and that in “the last storm [he had] only hurt himself while fooling others.” The intrigue in question was a reference to the contention for the chief justiceship, which was in full swing by 1829. For the office held by Sampson Salter Blowers, who was ailing and approaching 90, three candidates presented themselves: Richard John Uniacke Sr, also aged and frail, but whose long-time service as attorney general gave him a special claim on the office; Brenton Halliburton*, whose judicial talents were modest and who had already done well by government in being made a puisne judge within four years of his admission to the bar, but who had strengthened his claim by performing most of the duties of the chief justice over an extended period; and Archibald, whose many services to the crown qualified him for promotion. Archibald might have had the puisne judgeship made vacant by the death of James Stewart in 1830, but he considered his existing status to be superior. Uniacke died in October of the same year and Lieutenant Governor Sir Peregrine Maitland* made Archibald acting attorney general. But Maitland and the Council intervened in the contention for the chief justiceship by announcing that Halliburton would be sent to Britain, allegedly to remonstrate against the reduction of the duties on foreign timber imported into Great Britain. The real reason, however disguised, was to let Halliburton press his case for the chief justiceship. As a result, Archibald had no choice but to make his own trek to London. In Halifax it was wondered whether he sought the assistance of Lady Mary FitzClarence, the natural daughter of William IV whom the Archibalds had entertained royally in Halifax the previous year. After 1830 Archibald increasingly found himself out of sympathy with the majority in the assembly. In 1832, disagreeing with both Howe and Young, he favoured the commutation of unpaid quitrents owed the crown for an annual payment by the government of £2,000. In this instance any suggestion that he had a “private and personal interest” in increasing the crown’s casual revenues so that they could more readily meet the salaries borne upon them, including his own as attorney general, seems both unfair and far-fetched. Two years later Ichabod charged no less unfairly in the Acadian Recorder that Archibald had sought to have his salary as attorney general increased at a time “when the Treasury was drained to its very dregs, when any Money given to Roads has to be borrowed and when trade was languishing” under a general bankruptcy. During the 1836 election Archibald met a spirited electoral challenge in the recently created county of Colchester from Isaac Logan, one of the new breed of candidates, who mouthed Warner’s arguments. In bitterness that was rare with him, he denounced Warner as “the manufacturer of slander and libel” and Logan as “the Hawker, the Pedlar, and petty Chapman of his Wares.” “My name,” he continued, “shall remain and stand connected with Colchester when the name of Joe Warner shall be rotten as his compost, and stink like his dunghill.” Archibald also tried to “square the account” with Young in the first session of the new assembly, during which proposals were made to ban the export of grain and potatoes because of a crop failure. When, as was his wont, Young objected to interfering with the principles of political economy, Archibald scorned the idea of limiting the energies of the house in times of famine and distress by doctrines drawn from Adam Smith, asking, “Are we to be told that we are never to legislate in opposition to certain laws and rules which have been established by political theorists?” It was to be his last collision with Young, who died in October 1837. But it was Archibald’s only major contribution to the assembly that session, for although re-elected speaker he had lost the leadership of the house. Reformers, who had blossomed overnight, commanded a majority on most subjects and turned for leadership to Howe and Laurence O’Connor Doyle*. Archibald said almost nothing on Howe’s 12 Resolutions, but obviously he did not look sympathetically on the reformers’ disordering of the even tenor of the assembly’s ways. He did not preside over the closing days of the session because of illness, which newspapers attributed to erysipelas but which resulted from a severe stroke. He never fully recovered, and during his last few years he laboured “under a paralysis of the muscles, which disturbed the expression of the face, and at times rendered articulation difficult, if not impossible.” But he was restored sufficiently by December to move the major resolutions at a public meeting which deprecated the rebellion in Lower Canada and expressed a determination to look after the families of the soldiers who had left to put down the insurrection. He continued to preside over the assembly’s sessions to the end of 1840, but without participating in the lower house’s vigorous assertion of the popular cause. When a new lieutenant governor, Lord Falkland [Cary*], reconstituted the Executive Council in October 1840, Archibald headed the list of new councillors, but following the election of the same year he could not resume the office of speaker because of a decision taken in Britain to bring Nova Scotian parliamentary practice into accord with the British. Required to choose between the speakership and the attorney generalship, Archibald retained the latter. He did not remain in the assembly much longer, however, for after the death of Charles Rufus Fairbanks he was sworn in as master of the rolls on 29 April 1841, a position he held until a massive stroke killed him instantly five years later. Those who feared that his lack of legal knowledge and his dislike of labour made the choice a bad one were surprised by his application to the duties of his new office. If not a great judge, he was by general agreement a very good one; certainly his performance did not suffer in comparison with those of the other masters, Robie, Fairbanks, and Alexander Stewart*. Eloquent and imposing, Archibald brought dignity and sophistication to the Nova Scotian legislature. The Halifax newspaper the Sun rightly called him “one of the most amiable of men.” As Howe put it: “There was no venom or malignity about Judge Archibald – to give pleasure and to share it, was a necessity of his nature – but it never gave him pleasure to give others pain.” Israel Longworth is quite wrong, however, in claiming that “no other man contributed so much to mould the institutions and shape the destinies of Nova Scotia.” In an assembly committed to a program of moderate reform he found himself in an altogether inhospitable environment. Yet it can at least be said of him that as a constitutionalist he prevented the reactionaries from turning back the clock. PANS, MG 1, 89, esp. no.1a; 979–80. Acadian Recorder, 1830–36. Novascotian, 1830–46. John Doull, Sketches of attorney generals of Nova Scotia (Halifax, 1964). Israel Longworth, Life of S. G. W. Archibald (Halifax, 1881). G. [G.] Patterson, Studies in Nova Scotian history (Halifax, 1940). Peter Lynch, “Early reminiscences of Halifax – men who have passed from us,” N.S. Hist. Soc., Coll., 16 (1912): 199–201. J. Murray Beck, “ARCHIBALD, SAMUEL GEORGE WILLIAM,” in Dictionary of Canadian Biography, vol. 7, University of Toronto/Université Laval, 2003–, accessed April 20, 2019, http://www.biographi.ca/en/bio/archibald_samuel_george_william_7E.html.